4Inkjets, online at 4inkjets.com, is a leading supplier of discount inks, cartridges, and toners, 4Inkjets offers a complete line of printer supplies for virtually any inkjet or laser printer on the market. Find original and compatible inks and and toners for Canon, HP, Brother, Lexmark, Toshiba, Dell, Epson, Samsung, Sharp, Kodak, and others. 4Inkjets also offers paper and printers. You can't find your inks, toners, and printer supplies at better prices than at 4Inkjets.com. But before you shop, check out RetailSteal.com for the latest 4Inkjets discounts, 4Inkjets promo codes, and 4Inkjets coupon codes. 4Inkjets offers shipping promos that change often. Stop by RetailSteal.com for the best 4Inkjets shipping special offers. 4Inkjets offers standard and expedited shipping within the United States. 4Inkjets also ships to Canada. Act now and save 15% off your purchase from 4inkjets.com when you use this coupon code at checkout. Save up to 80% on ink and toner from 4Inkjets. Click here and save on inks for Canon, HP, Brother, Kodak, and more. Use this coupon code at 4Inkjets and save 10% on your ink and toner purchase. Shop at 4Inkjets and save with free shipping on purchases $50+. Click here to shop. 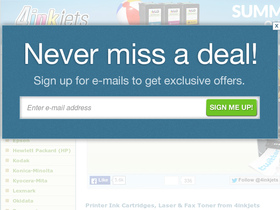 Save 60% on inks and toners when you buy compatible brands from 4Inkjets. Click here to save. Save up to 60% on recertified HP printers when you shop at 4Inkjets. Click here to shop and save.